Let’s mix it up at the Senior Center: I’ve been working on tiny charms: Can you say bracelet, gift tag, family tree visual? There are SAFE fun ways to use your photos, store and share them and your story! We’ll look at ways to get those photos out of the box, talking about our favorites and why, then exploring ways to use (& STORE) photos in a variety of ways. Lets talk. Taking the time to reminisce, talk about & preserve your memories into a portable digital format is one way photos can be shared and their stories told. Many objects of joy can be loaded onto photo frames to be displayed, or shared with family members. If you’re thinking about preserving your collection, stop by the senior center on the second Thursday of the month from 1 to 3 PM. You’ll be joined by others who have photos and stories to share. 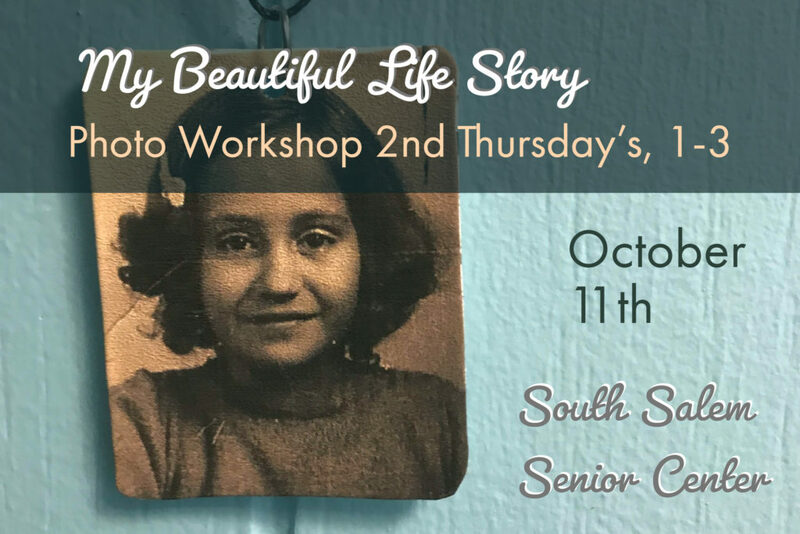 “My Beautiful Life Story” workshops are a fun way to meet your neighbors and share stories about your photos and memorabilia. During these sessions you’ll receive tips and tools about conserving your photo legacy. Come join us and learn how preserving your memories make sure the generations to come know about your personal history. Give them something to touch & hold. Don’t wait to think about organizing your photos. Discover secure ways to organize and save your photos, slides & precious stories. FUN 2 hour sessions held every third Thursday at the South Salem Senior Center. Meet your neighbors and enjoy storytelling with a bit of technology!